His Excellency Prof Paul Chepkwony, the Governor of Kericho County (Kenya) arrived in the UK seeking partners who would invest in his county. The trip included visits to Sweden and Germany. 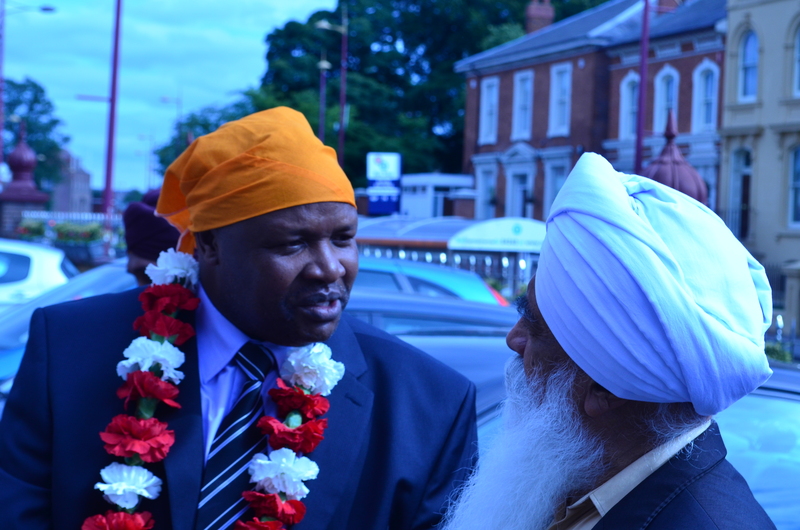 He visited Birmingham’s Guru Nanak Nishkam Sewak Jatha (GNNSJ) as part of his mission to strengthen shared responsibility to develop Kericho County. His Excellency Prof Paul Chepkwony was accompanied by his Chief of Staff Charles Kirui, Dr Moses Langat and other prominent Kenyans, mainly with links to Kericho County. The reciprocal visit was arranged following the recent visit of 160 GNSSJ volunteers going to Kericho for the free annual medical camp and contribution to other voluntary projects namely supporting a local orphanage, a local school, health projects and conducting a prayer service for world peace. The visit began with a humble presentation of single roses by the guests to Guru Granth Sahib Ji, the eternal Guru of the Sikhs and receiving Guru Ji’s blessings. This was then followed by a visit to the roof-top Guru Darbar (prayer court). The guests then visited the Guru Kitchen where they learned that volunteers prepared and served approximately 25,000 free meals every week. After visiting the Nishkam Health Centre and the Community Cooperative, the delegation made its way to see the Nishkam free schools. The dignitaries were then treated to a nostalgic exhibition about “the holy man of Kericho” marking the founder saint of GNNSJ, Sant Baba Puran Singh Ji’s 30th anniversary. Chairman of GNNSJ and Nishkam Centre, Bhai Sahib Dr Mohinder Singh, formally welcomed the esteemed delegation and shared with them Baba Ji’s stay in Kericho for over 49 years from 1925 to 1974 and his contribution to the town of Kericho. 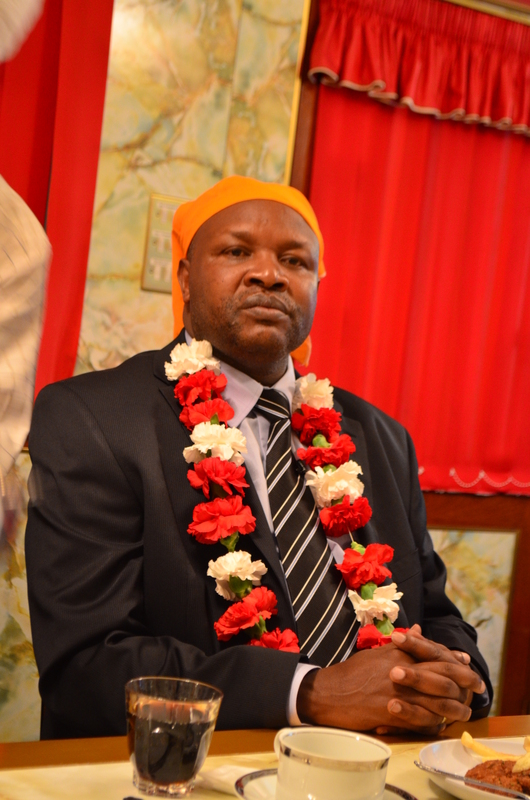 Bhai Sahib said: “We welcome our beloved guests and partners who have honoured us by making time from their busy trade schedule to see how we can create greater synergies with the projects we are involved in in Kericho”. Later he went on to conclude that values and education were crucial precursors for creating better professionals and human beings per se. The guests were in awe to learn that over the last 18 years GNNSJ had invested some £8m on projects in Kericho. Furthermore, 1,800 volunteers had spent on average 2 weeks volunteering per year in Kericho. This equated to almost £3m worth of voluntary hours. When it transpired that GNNSJ had attracted financial support from prestigious organisations like Aston Villa Football Club and Accenture the guests were moved. His Excellency, on behalf of the Kericho County and Kenyan Government pledged that he would not only support all future endeavours but he would mobilise resources at his disposal to ensure the success of all projects. He went on to offer financial support by way of match-funding to make Kericho County a model town. Having seen the examples of regeneration of the Grade II listed buildings in Handsworth, the Nishkam Schools and the values ethos, the delegation requested support to regenerate Highlands School in Kericho and pledged 200 million Kenyan Shillings to bring sports projects to fruition. The discussion continued around the need for a new consciousness, new ethos and mind-set coupled with empowering people with values to live in the new global village. Finally gifts were exchanged and Bhai Sahib Dr Mohinder Singh formally presented each delegate a gift. The day ended with the sharing of Langar (blessed vegetarian food) from the Guru’s Kitchen, where over one million free vegetarian meals are prepared and served every year to visitors by volunteers. For his services to religious faith propagation, community service, education and research, Bhai Sahib has been awarded two Honorary Doctorates from Birmingham’s Universities. He is passionate about values-based education and is the Patron of the Nishkam Education Trust which has set-up Nishkam Nursery (2009), Nishkam Primary Free School (2011) and Nishkam Secondary School with 6th Form (2012) and Nishkam School West London (Sept 2013).